A new generation is starting to publicly speak about the massacre of about 20,000 Taiwanese civilians which begun 70 years ago, on 28 February 1947. After several decades of silence, there is an increasing need to commemorate and seek justice for the atrocities. The difficulty for victims’ families to speak about the events demonstrates the ongoing pain from which the Taiwanese population has been suffering for too long. Growing up in the United States, Yu-Ting Lin had always known — through stories repeated in car rides to school — that his grandfather had died young, and tragically, in Taiwan. He had been a kind and generous physician who had set an example they should follow, his father told Lin all the time. His grandfather's alleged crime? He had been at the clinic with his colleagues, a group of doctors. It was March 1947, and in the fraught political atmosphere of the time, the gathering of any “elites” was enough to raise suspicions they could be conspiring against the Nationalist (Kuomintang or KMT) Party government, which ruled Taiwan then. In a confrontation with the doctors that escalated, Kuomintang officers opened fire on the clinic. A bullet struck Lin's grandfather in the neck; he died at home in Chiayi, in southwestern Taiwan, days later. He was 36 at the time, and he left behind a widow to raise six children on her own. Lin's family's story was not unique. As many as 28,000 Taiwanese civilians were believed to be killed after an attempted uprising in 1947, a systematic massacre significant not only for its scale but also for the silence that enshrouded the subject for decades afterward. Because of a 38-year period of martial law that followed the killings, it was verboten to even mention such deaths publicly. To this day, it remains a painful and controversial subject among Taiwan's older generation. But Lin represents a new generation that is determined to break the silence around what remains a dark stain on Taiwan's history. Unburdened by political oppression, the grandchildren of many victims of this once-hidden massacre say they feel compelled to gather oral histories and shine a spotlight on "2-28" before these atrocities are forgotten. Although it is often referred to in English as the “February 28 Incident,” the horrors associated with “Er-er ba” (literally "2-28" in Mandarin) were not isolated to a single day, nor did they begin Feb. 28, 1947. To understand Taiwan's history — and the forces that led to the massacres — one needs to go back more than a century, when the last imperial dynasty to rule China, the Qing, ceded the island of Taiwan to Japan in 1895. For 50 years, the Japanese occupied Taiwan. Upon Japan's surrender in World War II in 1945, the island of Taiwan was given over to Chinese control, then ruled by the Nationalist (Kuomintang, or KMT) Party. The Taiwanese, at first, hoped they would have a greater say in their own governance with the arrival of Nationalist leaders from China. It quickly became clear this would not be the reality, as tensions rose between the population already in Taiwan and the administration of Chen Yi, a KMT governor who had been appointed to oversee the island. On Feb. 27, 1947, those tensions reached a boil after armed agents tried to seize contraband cigarettes from a Taiwanese widow who had been selling them outside a teahouse in Taipei. When she resisted, one agent struck her on the head with his gun. The encounter soon attracted a crowd of angry protesters, horrified by the excessive level of force that had been used on the woman — and already at a tipping point after nearly two years of contentious KMT rule. In their haste to flee, the agents opened fire on the crowd, killing one bystander and wounding several others. The next morning, a large protest converged upon the governor's palace. In the days that followed, an uprising by Taiwanese citizens threatened to overwhelm the government. Soon, however, KMT leader Chiang Kai-shek ordered thousands more Nationalist troops to the island to help maintain order. What followed was a violent crackdown on all of Taiwan by KMT forces in which people who were perceived to be resisting Nationalist rule would be imprisoned and, in many cases, killed. Accounts of police officers unexpectedly arriving at the doorstep of a suspected dissenter were common; a household member would then be taken away for “questioning,” never to be heard from again. In the massacre that persisted through March 1947 and beyond, tens of thousands of Taiwanese people were systematically eliminated. In particular, the KMT targeted educated Taiwanese men — often doctors, professors, journalists or others considered to be “elites” — to suppress criticism of its policies. Stories would emerge later of groups of prisoners, accused of subversion, being strung together by their hands with wire and ordered to march toward a river; there one would be shot, and the rest would fall in and drown, in an effort to save bullets. Still others were killed in public spaces, execution-style, to serve as a general warning. For the May 24, 1947, issue of the Nation, American correspondent Peggy Durdin described a chilling account of what had taken place on the island since the attempted uprising. Governor General Chen Yi has turned a movement against bad government into one against any Chinese government. Meanwhile in China, in 1949, Chiang and the Nationalists lost the Chinese civil war to Mao Zedong's Communists, causing Chiang, the Kuomintang and the government of the “Republic of China” to flee to Taiwan. On the mainland, Mao established the People's Republic of China. For nearly four decades, Chiang would rule under martial law in Taiwan. Because of that, it became forbidden in Taiwan to even mention any disappearances or killings. And so, in households from Taipei in the north to Kaohsiung on the island's southern tip, missing family members sometimes went unmentioned, for fear of retribution by the KMT. Even after martial law was lifted in 1987, there remained a culture of silence, hardened by a pervasive fear of retaliation. It became, in essence, a hidden holocaust. It would not be until 1992, five years after martial law was lifted, that the Taiwanese government acknowledged such atrocities had occurred in a sanctioned report. 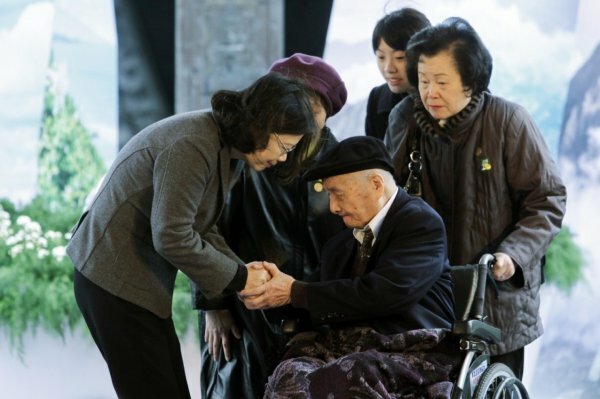 This week, Taiwanese officials marked the 70th anniversary since the country's darkest chapter began. Hundreds marched in Taipei in remembrance of 2-28 on Monday, and gathered across other cities Tuesday for somber commemorations of the day. Taiwanese President Tsai Ing-wen promised at her inauguration last year that there would be a new investigation and full report on 2-28 within three years, the Associated Press reported. “After 70 years, I believe that Taiwanese society now has the mature democratic mechanisms to discuss this matter,” Tsai told a gathering of victims, families and supporters in 228 Peace Memorial Park in Taipei, according to the Associated Press. Ryan, the author of “Green Island,” has seen a shift in attitudes around speaking about 2-28. The passage of time, too, has helped. She still remembers the first interview she conducted for the book, in 2002, in which her subject, an elderly woman, insisted that her name not be included in any notes. Even though martial law had ended 15 years before, there remained a fear that her words could cause trouble for her family, Ryan said. “Now, people are pretty open,” Ryan said. Some volunteer their stories at book signings. Others email her. At a recent book reading in New York, at least one young woman told Ryan the stories told in “Green Island” prompted her to speak to her Taiwanese mother about her history for the first time. Michael Bok-bin Tsioh, a doctoral student at the University of Texas at Austin, said learning about 2-28 and living in the United States has given him a deeper appreciation for freedom of speech — something he does not want to take for granted by staying silent about the massacre. For 34-year-old Jennie Chia-Chun Chung, learning about 2-28 crystallized so many moments from her childhood in the United States that had not made sense to her before: Why her parents decided to leave Taiwan in 1996, fearing unrest surrounding Taiwan's first democratic election that year. And why her mother had sat down with her before Chung left for college, with an unsolicited piece of advice: Stay away from politics. “Back then, I didn't really know why she said that,” Chung said. In her 20s, she started researching Taiwan's history more, and it became clear. She began asking her now 88-year-old grandmother, as well as other relatives, what it had been like to live through the reign of White Terror. “It took them a long time to really be able to talk about it. They very slowly opened up,” Chung said. Her grandmother explained that their grandfather had saved someone who was wounded in the government crackdown and helped keep him in hiding — a move that then put their own family at risk. “She told me this story, and it was just a whole side of my grandfather I had never known,” Chung said. Chung has felt compelled to record those conversations as a way to preserve a part of her heritage, she said. The videos are informal, with her grandmother speaking a mix of Mandarin, Taiwanese and Hakka. But to Chung, they serve as an important way to “properly handle the aftermath, the emotional trauma” of 2-28. Whereas the older generation has hesitated to speak out, she feels differently. Christenson told The Washington Post that he had learned about that chapter of Taiwan's history several years ago — but this year its themes resonated with him even more. He agreed without hesitation to sign a proclamation. In December, Lin traveled back to Taiwan and thought he would try, yet again, to broach one of his family's most sensitive subjects with his eldest aunt. “What do you remember about Ah Gong?” Lin asked his aunt gently, using the Taiwanese word for grandfather. Lin remembers that she hesitated. She insisted she couldn't remember much; she had only been 11 years old when he was shot. “It was so sad,” she said, simply. That was as far as she could go before she began to weep. “I literally think she's never talked to anybody about it all these years,” Lin said. He holds out hope that his aunt one day will allow him to record her story. Whenever he visits Taipei, Lin also stops by the 228 Peace Memorial Park, where his grandfather's name — Lin Fang Yu — appears along with hundreds of other victims. To this day, Lin said his parents are wary of speaking to a reporter directly about their accounts of that period. Their own parents had taught them to “just listen, never speak” in fear that the KMT would take them away. He hopes to break that cycle.